Ahhh last week at the MTC. I leave on Wednesday the 12 at 6am I'm so excited!! So with the departure of our ASL sisters we got 4 new roommates. I haven't really gotten to know them very well. They are going to California English speaking. They are in a different zone then us so other then the room we don't see them much. Oh hahaha so the first night Sister John and I pretended to be deaf :P It was really hard not to react to sound and not talk to the girls. They all bought it until we told them the next morning. They are all very quite right now as its only their second day. Hopefully we will all warm up to each other before we leave. So let me tell you about my first few days of temple training. So there are 34 sisters in our training class and 24 of them are coming to Temple Square the others are going to Winter Quarters in Nebraska, Washington DC and one sister is headed to Hawaii. It is very different from my ASL district no elders and 34 girls all speaking English. Though I still like to sign to Sister John quit a bit :) I'm going to miss her, only 5 days left as companions..... :( The teachers are all Visitor Center RMs and are so excited for us. They all loved their missions and love sharing their experiences with us. The first day we got to go to Temple Square for about an hour and get a tour by the sisters just get a feel for things there. It was supper amazing even though we only saw a very small part of the square. I didn't want to leave and I am so excited to go back....! Ya that's right we get to go on splits with the sisters there for 4 hrs. I'm so so so excited! 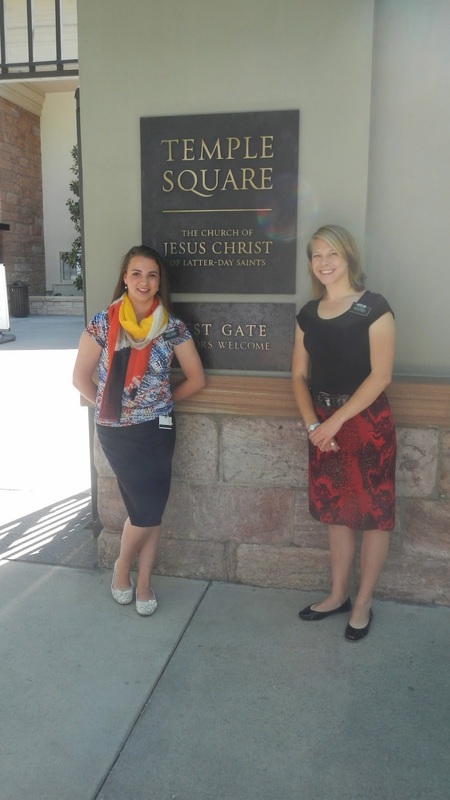 I have so many questions about life at Temple Square, cant come soon enough! Probably the best part of temple training so far is the on line chatting we get to do with investigators. The system has been pretty glitchy these first few days so Sister John and I haven't been able to actually talk to anyone for more then a few minutes. Some other sisters have had some very interesting conversations. I know its hard to believe that someone can be converted over the computer. Just hearing the other sisters talk about their experiences I know God is using these latter day technologies to spread the word. People from all walks of life come to mormon.org looking for answers to their questions. The Lord has prepared them and so many people have been brought to Christ thought this website. I love that we can make a connection with someone on the other side of the world and get to stay in contact with them throughout their conversion process and for long after too. Some of the teachers we have are still in contact with the people they met over mormon.org, I cant wait to have some of these opportunities to share the gospel. Ive learnt so much in these last few days and I can feel my testimony growing in leaps and bounds. We had an excellent lesson on planning, something that my teacher said that I will never forget (I'm sorry cant remember names as I have had 10 new teachers.) Planning is spiritually creating your day. I love that, it makes me look at planning differently. We have been focusing on vision a lot. What do we see for our investigators and what do we see for ourselves. Trying to see others as Christ sees them. If Christ was giving the tour how would he greet these people? How would he treat them? Ive been really trying to focus on that lately.